Also on this date, June 18, 1940, Soviet Foreign Minis­ter Vya­ches­lav Molo­tov con­grat­u­lated Adolf Hitler for the “splen­did suc­cesses of the Ger­man Wehr­macht” (armed forces) in France and the Low Coun­tries. Molotov would live to regret his flattering words just over a year later, when Hitler vio­lated the Molotov-Ribben­trop Non­aggression Pact of August 1939 by launching his surprise invasion of the Soviet Union (Operation Barbarossa). 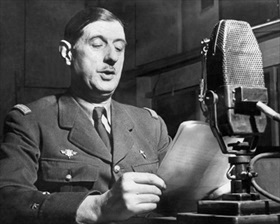 Left: Gen. Charles de Gaulle in the studios of the BBC in Lon­don, Octo­ber 10, 1941. This photo­graph has some­times been used in con­nection with de Gaulle’s “call to arms” speech of June 18, 1940, of which no photograph exists. 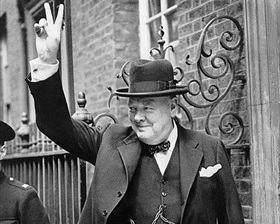 Right: Winston Churchill giving his famous V-sign (used to repre­sent the letter “V” in “Vic­tory”) on May 20, 1940, just ten days after he became prime minis­ter, and on the day Ger­man troops reached the Eng­lish Chan­nel in pre­pa­ra­tion for their exter­mi­nating the British Expedi­tionary Force trapped at Dunkirk on the French coast. 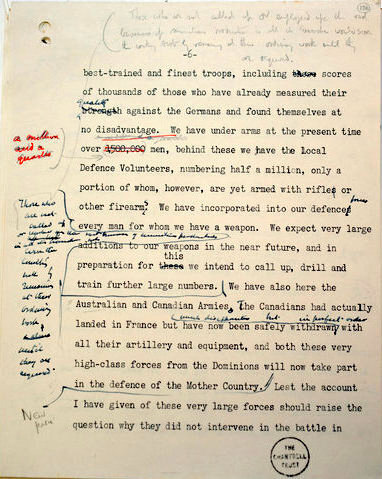 Below: A draft of Churchill’s “Finest Hour” speech shows the way he exten­sively edited it before deli­vering it to the House of Com­mons on June 18, 1940. In 36 minutes of soaring ora­tory, Chur­chill sought to rally his country­men with what has gone down in his­tory as his “finest hour” speech. The speech—ending with the words, “Let us there­fore brace our­selves to our duties, and so bear our­selves that if the British em­pire and its Com­mon­wealth last for a thou­sand years, men will still say, ‘This was their finest hour’”—has reso­nated ever since. On both sides of the Atlan­tic and beyond, it has been hailed as the moment when Brit­ain found the resolve to fight on after the fall of France and, ulti­mately, in alli­ance with Allied mili­tary forces (what would be called the United Nations) to van­quish Hitler’s armies that had overrun most of Europe.